The photo memory book for this trip is available through AdoramaPix. 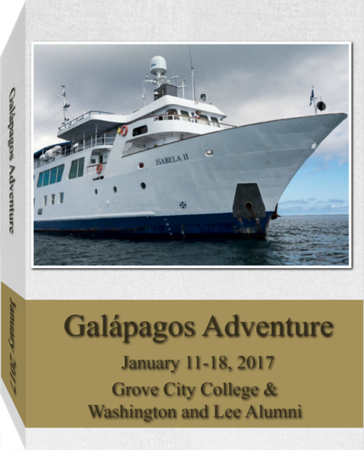 The pages are filled with images that are sure to bring back memories for past visitors and, perhaps, to spark the Galapagos travel bug in those who haven't been there. This book is thick (1"), fairly hefty, and amazing! It's 100 pages long and has more than 500 images on its pages. I like it best in the largest format available, 12x9 inches, two smaller, less expensive sizes are also available. As of March 2017, AdoramaPix charges nearly $215 for a copy, certainly non-trivial, but the quality is amazing. The pages are stiff and covered in real photographic print images. The Luster finish presents tack sharp images in a finger print resistant finish, but if you prefer other finish styles, they are also available. You can order a copy of the book by clicking on the image to the left will take you to the AdoramaPix website. If you don't have an AdoramaPix account, please consider using my referral link which will get us both a small discount.